What Started the Grimm Fairy Tales? 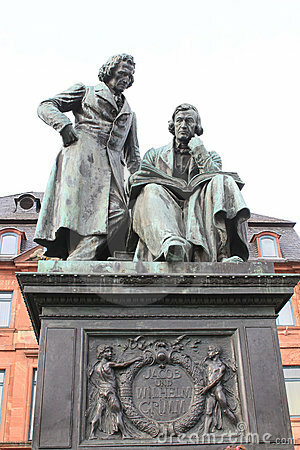 Jacob (1785–1863) and Wilhelm Grimm (1786–1859) were born in Hanau, Germany. They were the second and third-oldest surviving siblings in a family of nine children. Their father Philipp Wilhelm Grimm died January 10, 1796, at the age of 44. Then three of his nine children preceded him to death. After their father's death the family moved into their aunt's house for financial reasons. In 1802 Jacob begins his study of law at the University of Marburg; Wilhelm fallows him the next year. They had difficulty in school because of their financial status. Though it pushed them to try harder in their academic studies. Jacob interrupted his studies to serve the Hessian War Commission in 1806 but later lost his position. After their mother Dorothea Grimm dies they both had to work hard to support their many siblings at a library in Kessler. In 1812 the Grimm brothers published the first volume of Kinder- und Hausmärchen (Children' and Household Tales – commonly known as Grimms' Fairy Tales), a book containing 86 numbered folktales. Over the years they created a total of 585 German legends. Their book became one of the most influential books in the German language. They lived out their lives as academics, cultural researchers and authors of folklore. They wanted to salvage relics from the past from the beginning to the end of their work on the Kinder-und Hausmärchen. The Grimms sought to collect and preserve all kinds of ancient relics as if they were sacred and precious gems that consisted of tales, myths, songs, fables, legends, epics, documents, and other artifacts. Not just fairy tales. They called their collection of tales an educational manual because the tales recalled the basic values of the Germanic peoples and also other European groups and enlightened people about their experiences through storytelling. It is probably just the right time to gather these tales, since those who have been making an effort to preserve them are becoming even harder to find (to be sure, those who know them still know a great deal, because people may die, but the stories live on). . . . . Where the tales still exist, they live on and no one worries whether they are good or bad, poetic or vulgar. We know them and we love them just because we happen to have heard them in a certain way, and we like them without reflecting on why. Telling these tales is an extraordinary custom — and this too the tales share with everything immortal — that one must like it no matter what others say. The original collection of tales enjoyed wide distribution in Germany and eventually in all parts of the globe (there are now translations in 70 languages); it became and remains a model for the collecting of folktales everywhere; and the Grimms’ notes to the tales, along with other investigations, formed the basis for the science of the folk narrative and even of folklore. To this day the tales remain the earliest “scientific” collection of folktales. There was a theory that the Grimms' tales, particularly the more brutal ones such as How Children Played Butcher With Each Other, in which a whole family massacres itself, had an adverse effect on the German character. In his 1978 book Roots of German Nationalism, Louis Snyder argued that the brothers helped to shape certain deleterious traits, such as discipline, obedience, authoritarianism, glorification of violence and nationalism, which became part of the national character. That was the reason-allied commanders banned the book in schools after the war, arguing that they had found the roots of Nazism in the Grimms' world. Today the Grim Tales are actually more popular out of Germany than in it.